Whether by design or simply coincidence, Nintendo managed to bury its financial results behind a Splatoon Direct, though for the first time in a few years the reports were actually positive. Nintendo made a larger than expected profit despite missing some sales targets, and expects improved revenues and profits in the year to come. Sales targets for the Wii U and 3DS may be rather modest, but it seems that investors were relatively pleased by what they saw. Though Nintendo only plans to release around five smart device games before 31st March 2017, the first of those will arrive in 2015. Nintendo share prices enjoyed a bump over the past 24 hours following those financial results, closing today on 21,155 yen, a healthy increase of over 7%. 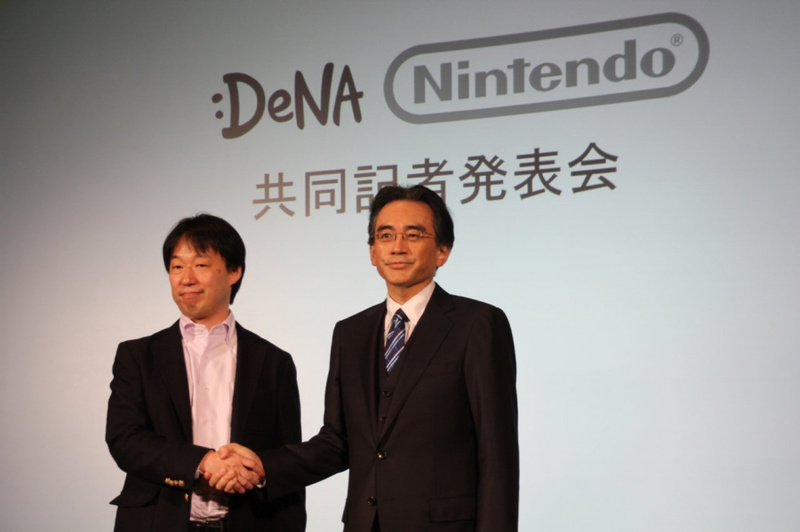 That was the biggest surge in the last seven weeks, after the share value dramatically increased upon the announcement in March of the smart device partnership with DeNA. Satoru Iwata is reported to have stated, meanwhile, that previously announced plans to create a new console for developing markets - such as China - are being put back, with the company instead prioritising bringing its smart device games to these territories. Yasuaki Kogure, chief investment officer at SBI Asset Management Co. in Tokyo, is one analyst that's supported that move. Launching a new console in an emerging market and risking failure is not something investors would welcome now. Mobile not only offers an existing platform in developing counties, but also a low-cost way of testing the market. Though Nintendo's sales goals - as mentioned above - are modest for Wii U and 3DS, investors have clearly been happy with those annual financial results. From Satoru Iwata's perspective, that's an important part of his job done. Why can't Nintendo release Wii U and New 3ds in China? Can't they just disable online features or just disable online connectivity completely on Chinese Wii U's. I'm saying this because of China's strict rules to the internet. Facebook is blocked in China! Its definitely smarter to not bother with the 3DS and Wii U in countries like China and just got for smartphone stuff. People don't seem to grasp how much work and money it takes to pull that off. Good news, this plus their large cash reserve hopefully translates into developing new IP and taking some risks in that area. @AyeHaley Actually, the Nintendo 3DS XL at least is already available in mainland China under the brand name iQue 3DS XL, and while some games are available at retail, Nintendo are releasing many of their games as Chinese eShop-exclusives which are available for retail in most other regions. China is a corrupted country. @Nintendude789 Thanks for that fascinating insight. Their transition to 3rd party status is beginning. @Quorthon I can't be the only one that just read your comment in the Emperor's voice. Particularly the "gooood... goooooodd..." part. @Quorthon I hoping very much you're aren't talking about the N3DS, because I would laugh hard. @HopeNForever Their iQue projects are not the same going full on Wii U+3DS in China. Smartphone games could lead to higher interest in a new localized full-on Nintendo console, especially if you look at the amount of smartphones they sell over there. Lots of jailbreaking and the desire to get it all for free though...but that is pretty much the same over here. People are still banging the "third party" drum? 1. People in China do not make the income in 1st world nations. While China economy is strong with trade practices ( shipping and made in China clothing and products ) the reality is that Chinese people will not purchase certain things. This has proven because of the GREAT MALL OF CHINA INCIDENT. Many Chinese venders hope to sell things to it's people but discover that nobody is buying anything. 2. A new law in China prevents people in that nation from selling computer parts and computers. Meaning once it goes into China it becomes property of China. China is collecting raw material basically to use as commodity against the rest of the world. Japan is also melting it's old computers down for raw materials as well. 3.Hong Kong Pirate theory. Because everything is made in China, and the government owns the land and can attempt to force you to leave and bulldoze your house without warning. Many Chinese/Asian/etc eastern ( smart and stupid ) have been practicing using computers. A poor family in America probably have people right now using computers from 1991 as entertainment systems. That is why it is impossible market in China. 4. Famicom. Again many Famiclones and such systems exsist and people plays with those systems. Chinese people ( including Japanese etc ) are people who live with technology as an burden. So it does not really affect them as the "peoples nation" or "Mother China" which means they sacrifice for the whole of one, willingly or unwillingly. 5. As somebody said that China is corrupted can be proven true. Basically you go up against the government they go up against you. The same with the United States and "House of Un-Americans/Federal Government". People who have spoken against the war ( so long since 2001, that kids are dying over it ) have had various agencies attempt to imprison them and shut them up. if you were in China right now and started an newspaper that spoke against the government along with cruelty against people and stuff like that. Chances are the Chinese government would attempt to put you under house arrest. In the United States they do the exact same thing with people who are for or against the war attempting to push them into an position of fear without knowledge; because you have gained an audience that has the ability to make an difference in the nation. This is where Chinese corruption and other nations are the same exact thing. They are doing something wrong and do not want the people to do anything about it. I don't get why investors are simply happy about the smartphone gaming that Nintendo plans to do? Aren't they still shareholders so that the whole point of them being shareholders is to avoid being open to buyouts? China made all the flash carts to pirate Nintendo games, releasing the consoles in China is just stupid... no one will buy the games. I think it's a horrible move for them to put games on any other devices while having their own consoles. You're not Google or Amazon, this is a much different market than what those two companies compete in, Nintendo. It's virtually impossible for a video game company to be a console manufacturer and part third-party developer at the same time. Hasn't happened before, and probably nothing will change that. Iwata claims he believes incentivizing those that buy games on multiple devices will entice people to buy their hardware. What the current guy in charge thinks we don't know is that since plenty of people already have PCs, smartphones, and tablets, they have no reason to buy Nintendo consoles because they can just get them elsewhere. Unless the only way people get discounts on Nintendo games is having a Nintendo console in addition to a tablet, smartphone, or PC with the new ID program, I don't see the discounts enticing people to buy Nintendo HW. Let's be honest, Nintendo probably does not want to "force" people to buy their hardware, and people will not see a reason to buy it if they can get good enough games on smart devices and PCs, and discounts if they get Nintendo games on smart devices and PCs without buying Nintendo consoles. This is likely the first step in them going third-party, which is horrible news for Nintendo fans and gamers in general, both of which don't know it yet. Look at any company that started out as HW manufacturers that went software only, it's been pretty ugly in the long term. What's worse is some brilliant minds here and in various gaming outlets think it's better for Nintendo to go third-party, which is foolish and short-sighted for so many reasons. Some of us like to have fewer console competitors because we don't get that when there are fewer choices, the remaining parties can charge whatever the hell they want, and it won't be what they're charging now. @IronMan28 I definitely question how well Nintendo would do as a third party developer. Im a big sega fan, and it's been tough watching the company go from the Genesis glory days to where we are now. @BinaryFragger "If that's the case, shouldn't their games sell like hotcakes on PC/PS4/XB1?" While I agree with this sentiment, and all of your post, I must say it still plays into what I was implying. Third-party Nintendo would be good for maybe a generation or two, then go to hell. That's been the general pattern for the other companies that did the same thing. And it's definitely a catch 22 with the mobile games situation, gives people no reason to buy Nintendo consoles if they can play them on a device they already own. I personally hate the move for a number of reasons, but maybe consoles will be dead altogether in a generation or two anyway. Who knows? @Superryanworld I couldn't agree with you more.